I finally upgraded to the iPhone 4 from Apple and my “hand-me-down” 3GS went to my new bride Tish. When Apple first began to release details of its latest phone I was eager to test the higher resolution 5 megapixel camera (versus 3ish of the previous phone). And with the last iOS update this new device now has the capability of HDR or High Dynamic Range photography. What a pleasant surprise. What is HDR? An easy explanation would be to think of it as “high-def” photography as the range of colors and tones displayed is greater. To an Ansel Adams apprentice wannabe such as myself I find this new feature simply stunning. I would go so far as to say this is the greatest contribution to digital photography in recent years. The ability to create HDR images has been around for several years but was done “after the fact” in Photoshop or similar software program. Previously we would select an exposure bracketing mode on the camera to capture variations in tonal range but have to choose only one of these shots as the final image or merge them with software. These days, camera manufacturers are beginning to offer the ability to create an image in the camera that is made up of more than one image of the same scene at slightly different exposure levels and combined in the camera itself. And the Apple iPhone 4 is the first smartphone I have seen to offer this exact feature. While still in its infancy, this capability is rockin’ my shutterbug world. The process is in its infancy and is not perfect. The subject of the photograph has to be or remain dead still – landscapes and still life are ideal. 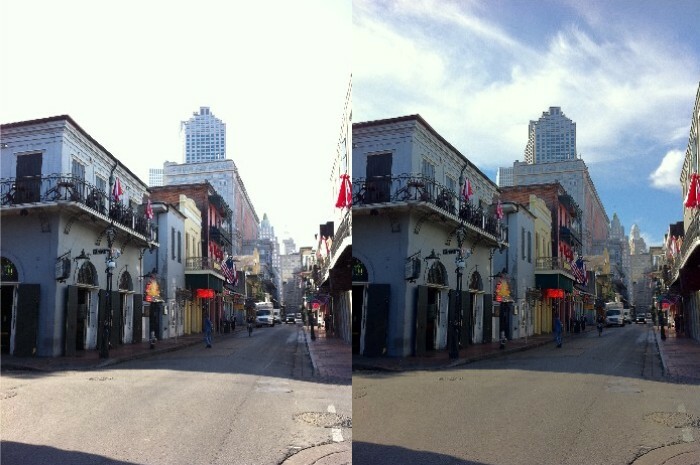 In HDR mode the iPhone 4 shoots three images in rapid sequence but any motion in the scene being captured will show. A quick check of the eight Ansel Adams images hanging on my walls at home show none containing moving subjects. Adams was the master of tonal range in photography (primarily black and white) thanks to his Zone System and I appreciate the HDR camera functions in the iPhone 4 as almost a digital Ansel Adams camera. I have not used HDR in Photoshop nor on any of the modern digital cameras that offer it, but then again the iPhone 4 is not primarily for photography and that is why I admire it so. The HDR function is selectable with the touch of the top center of the iPhone 4 screen when in camera mode. Not every photo op will lend itself to HDR so a bit of personal experimentation will be in order. A setting option on the device allows the user to save a non-HDR version of the image to the photo album when in HDR mode and this is how I have mine set. 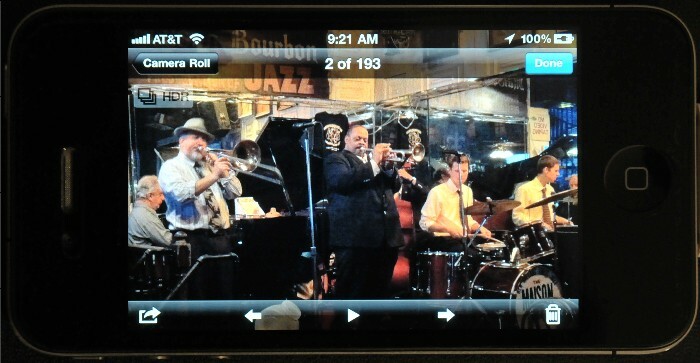 A recent trip to New Orleans provided opportunity to put the iPhone 4 to the test. Everywhere we went offered photographic subject matter, day and night. I am impressed with the iPhones’ technological progress to this point and I shudder with anticipation at what the future may hold (and I haven’t even touched on the video capabilities of the iPhone 4 yet).